Vendor innovation has shifted from more slices to dose management, speed, and efficient workflow. CT vendors have focused on reduced dose management, faster diagnosis, and more efficient workflow. As recent product introductions demonstrate, they’ve attempted to accomplish this without sacrificing image quality while also acknowledging the current global economic environment. Of course facilities are concerned about how that couples with cost. The facilities Gungor speaks of represent a broad swathe, ranging from rural and community hospitals to imaging centers and all the way up to academic institutions. Nearly every facility needs to be concerned about the price tag. Vendors are addressing these concerns. 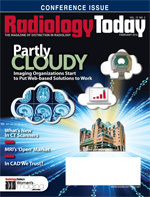 Recent introductions, and the RSNA 2011 showcase, demonstrate how. At RSNA 2011, this vendor had much to display. It showcased its Ingenuity family of scanners, which includes the Ingenuity Core and Core128. The first is an entry-level 64-slice scanner that features 4-cm patient coverage. The second, as its name implies, is a 128-slice scanner. It provides 33% improvement in x-axis spatial resolution as well as advanced clinical capabilities and improved image quality at low dose. According to Philips, this iterative reconstruction technique provides clinicians the control to personalize image quality depending on clinical needs at low dose. The combined technologies developed in the iCT, Ingenuity, and Brilliance scanner families provide an approach to managing critical factors—low energy, low dose, and low injected contrast imaging—as well as robust artifact prevention, reduced noise, improved spatial resolution, and rapid reconstruction. Philips also highlighted a feature called O-MAR (orthopedic metal artifact reduction) that will extend across its CT product family. It was designed to address the presence of large metal objects, such as orthopedic implants, that pose problems for diagnosis and treatment planning. O-MAR isolates the effects of metal objects in image data and reduces associated artifacts. “With the aging population, clinicians very often see patients with hip and knee replacements, and O-MAR enables a scanner to remove the artifacts when imaging such patients,” says Smith. And reducing such artifacts can improve image quality for orthopedic structures and improve a clinician’s diagnostic confidence via the enhanced visualization. Essentially, iCT TVI meets the needs related to head-to-toe vascular imaging. This advance delivers exceptional image quality, and it reduces radiation dose and the amount of injected contrast. “Full-body scans can be accomplished in less than five seconds and cardiac exams accomplished with up to 75 beats per second without beta-blockers, integrated with fast workflow, and performed at low dose,” says Smith. Further, it features lower kilovolt peak settings and the iDose4 technique. FDA approval is pending. Smith says Philips anticipates this to be commercialized in the later part of 2012. Meanwhile, the other products mentioned are commercially available, and the Ingenuity systems are designed to enable existing Philips customers to easily upgrade to more powerful systems. GE Healthcare also addresses the issues of artifact reduction and material separation, with its recently introduced Gemstone Spectral Imaging (GSI) CT application. GE developed its new generation of GSI technology to improve image quality and ease of use. It’s particularly practical and valuable in characterizing lesions (ie, size and nature) in one exam. “GSI moves CT beyond anatomy to enable quantitative CT that can characterize material composition, and is unique because of its fast kV switching to virtually eliminate registration artifacts,” says GE Global PR Manager Benjamin Fox. As GE points out, since CT’s inception, clinicians’ view of anatomy has been limited by potential artifacts and the inability to distinguish between different materials of the same density. For instance, as the company relates, metal implants can generate artifacts while materials like iodine and calcium are difficult to differentiate. Utilizing two different energy levels to separate and quantify materials such as calcium, iodine, and water, GSI-enhanced images offer significant artifact reduction and improved clarity. GE Healthcare developed a new CT technology called Veo, a new model-based iterative reconstruction technique. “Customers always had to balance radiation dose and image quality,” says Nilesh Shah, chief marketing officer for CT for GE Healthcare. Typically, optimizing one compromises the other, but GE addressed the prevalent conundrum with the Veo system. As the company describes it, Veo threw open the door to high-image performance at previously unperceived CT low-dose levels. Veo has submillisievert capabilities that help deliver confident diagnosis— with potentially lower noise (standard deviation), improved low contrast detectability and spatial resolution, and fewer low signal artifacts. The company points out that in clinical practice, Veo may reduce CT patient dose depending on the task, patient size, and anatomical location. A consultation with a radiologist and physicist should be made to determine appropriate dose to obtain image quality for a particular task. Also, in clinical practice, LCD level, spatial resolution and low signal artifact may vary. Siemens had a lot to display at RSNA 2011. It spotlighted its SOMATOM Definition Edge and Perspective CT systems as well as its new Stellar Detector system and its SAFIRE image reconstruction protocol. “Our bumper crop of new CT solutions dominated our list of RSNA ’11 new offerings,” says Jeff Bell, Siemens’ senior manager of media relations for imaging and therapy systems communications. It will be the first Siemens CT scanner to offer the eMode software solution. “The ‘e’ means economy, and it scans patients at a reasonably low dose,” says Gungor. • be placed in smaller rooms due to its slim gantry and footprint (18 m2). Further, it may use just 71 kVA of electricity and may emit approximately 7 kW of heat, and its Fully Assisting Scanner Technologies (FAST) features may potentially simplify and automate time-consuming, complex procedures. • CARE (Combined Applications to Reduce Exposure) Dose4D that adapts the X-ray tube current in real time for the entire scan region, ensuring consistently high image quality while keeping dose as low as possible for all organs and types of anatomy. Another potential dose-saving technology is the iterative algorithm Sinogram Affirmed Iterative Reconstruction (SAFIRE), recently cleared for domestic sale by the FDA. A method for CT image reconstruction based on raw data, SAFIRE may potentially achieve a dose savings of up to 60% for a wide range of applications. Also, the use of projection raw data during the iterative image improvement process enables a reduction of subtle image artifacts with a reconstruction speed as fast as 15 to 20 images per second. Also, an Illumination MoodLight with adjustable LED panel is integrated into the SOMATOM Perspective to brighten the sterile atmosphere of many exam rooms. “It was designed to improve the patient experience,” says Gungor. It is the first single-source CT to use Siemens’ recently developed Stellar Detector designed to virtually eliminate electronic noise. Siemens’ TrueSignal Technology fully integrates the electronic components of the detector elements with the photodiode for the first time, thus reducing electronic noise and cross-talk and increasing the signal-to-noise ratio. With the Edge, in routine examinations, structures as small as 0.3 mm are visible, and image sharpness may improve. With a rotation speed of 0.28 seconds, it is Siemens’ fastest single-source CT scanner, acquiring up to 23 cm per second. Such speed may enable physicians to perform customary thorax-abdomen examinations in approximately two seconds and potentially eliminate the need for patient breath holding during a scan. Toshiba contributes to CT advancements with its Aquilion ONE, which enables dynamic imaging of an entire organ. The result is to reduce diagnosis time from days into minutes. Cooper says this capability has clinical benefits for patients with symptoms of acute stroke, those who arrive at the emergency department with chest pain, and ever-restless pediatric patients. The system deploys 320 ultra–high-resolution, 0.5-mm detector elements to image an entire organ—be it the brain or the heart—in a single rotation. Toshiba also highlighted a software package—currently available only outside the United States—called the AIDR 3D (adaptive iterative dose reduction). “It’s our third generation of dose-reduction software, and it provides users the ability to improve image quality while lowering dose for all CT exams,” says Cooper. It’s pending 510(k) clearance, but outside of the United States it has proven to lower radiation dose compared to conventional scanning. This algorithm works in both raw data and image data space, reducing noise to maintain image quality. The Aquilion Prime system is also pending 510(k) clearance, but it is currently available outside of the United States. — Dan Harvey is a freelance writer based in Wilmington, Delaware, and a frequent contributor to Radiology Today.